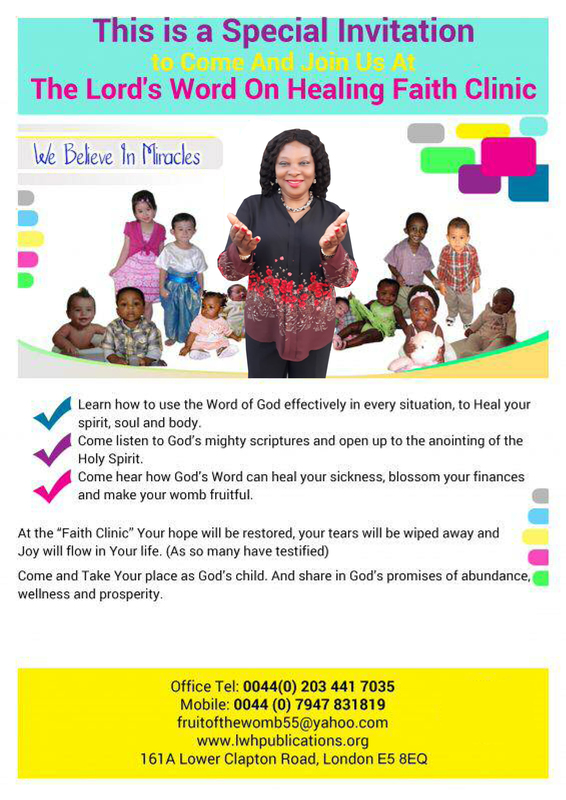 You are invited to come and join us at the LWH Healing Centre Faith Clinic. Many lives have been changed by the power and anointing of God’s Word at the faith clinics. The Lord gave Veronica Anusionwu the vision of “The Lord’s Word On Healing Publications Faith Clinic” in 1995. In this vision, she saw God perform miracles in the lives of millions of people. Missing legs were recreated, missing reproductive organs was recreated, and women who had lost hope of having children were blessed with children. In this vision, I saw blind eyes restored. Many sick people with all kinds of ailments were healed. Many hurting and broken families were restored, and joy was brought back into many homes. All types of sicknesses and diseases were miraculously healed. Praise God! Since we started the Faith Clinic, we have stood in prayers with many men and women and families who are now blessed with families of their own. We have seen all kinds of miracles, as you can see on the testimonies on our website. The Faith Clinic is a ministry tool of the Holy Spirit through which the name of Jesus Christ is exalted all over the world. The Clinic runs once every month, except August and December. Please send Veronica an e-mail at info@lwhhealingcentre.com for more information and request a Faith Clinic application form or just come over! The Faith Clinic is designed in such a way that people can come together and join their faith and pray together and receive all they desire from God. Trains: The nearest train station is Clapton Station (overground train line) situated on the A107 Upper Clapton Road, about a 10-minute walk or Hackney Downs Station (overground train line) also about a 10-minute walk. 38, 48, 55, 106, 253, 254, S2 (Get off at Linscott Road OR Clapton Girls Academy Bus Stop). There is free parking on nearby streets. Veronica Anusionwu and her ministry team will be locking up with a group of women to declare war on the spirit of fibroids. We want to say to the Devil, “Enough is enough!” We will use the authority of the name of our Lord Jesus Christ to overcome this problem. Please invite as many of your friends as possible. You can visit this page for more details or call the number above. 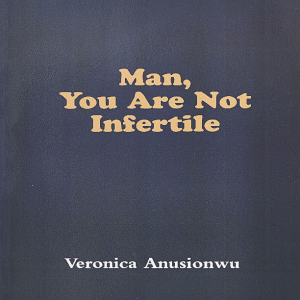 Read Veronica Anusionwu’s— new book before the meeting. 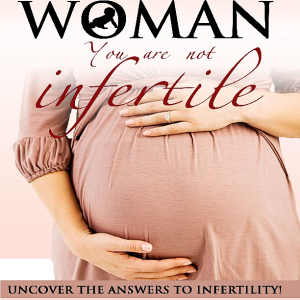 In this exciting new book, Veronica Anusionwu brings you winning principles from the Living Word of God to help you triumph over growths that occur in the womb. The fear of cancer and some of these growths have struck fear in the hearts of millions of people all over the world, yet the Word of God, the Bible, is the solution to all these growths. The Bible says that the Word of God cannot be bound. You will discover that the Word of God cannot be bound but has all power to destroy growths in the womb. You will also discover that there is enough power in your mouth to destroy growths from your life. You will discover that Gods´ Word in your mouth has firepower and cannot be chained. 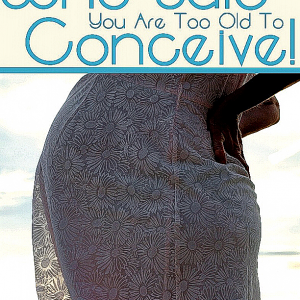 Experience the yoke-destroying power of the Holy Spirit in this book, “Triumph Over Growths That Occur in the Womb”. Learn how to use the Word of God effectively in every situation, to heal your spirit soul and body. Come and listen to God’s mighty scriptures and open up to the anointing of the Holy Spirit. Come and hear how God’s Word can heal your sickness, blossom your finances and make your womb fruitful. Come and Take Your place as God’s child; and share in God’s promises of abundance, wellness, and prosperity.